Parking: Parking is available behind the Copley United Methodist Church at 1518 S. Cleveland Massillon Rd and the back parking lot behind Copley-Fairlawn Middle School on Schoolcraft Road with shuttle service to the Copley Circle Gazebo. Details: Copley Revisited Walking Tour of the Copley Circle neighborhood will begin at 1:30 pm at the charming Copley Circle Gazebo located directly at the intersection of Cleveland Massillon Road and Copley Road.Red balloons will identify the tour group at the Gazebo. (Just south of Copley Circle parking is available at the Methodist Church or on Schoolcraft Road in the lot behind Copley Fairlawn Middle School; a shuttle service will run to the Gazebo from both lots). In honor of Heritage Day, the tour will feature the under-appreciated historical significance of the Circle and Township along Cleveland Massillon Road and Copley Road, and then introduce you to many of the small businesses of Copley. Along the way, we will consider some of the opportunities and challenges faced by the Copley Circle neighborhood. The tour will wrap up at 2:30 pm returning to the Gazebo, in time for the Hula Hoop Contest part of the Heritage Day Celebration. A post-tour reception will be held at the Circle. The tour will be led by Copley Residents, members of the Copley Circle Advisory Board supported by the rich resources of the Copley Historical Society. 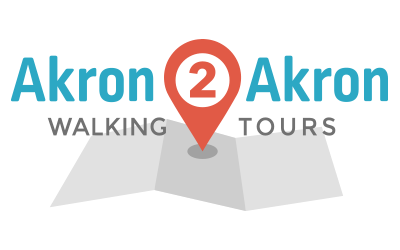 This walk is independently organized and is not part of Akron2Akron's regularly scheduled monthly walking tours. Are you interested in creating your own walk? Let us know!